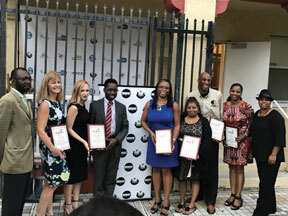 MIAMI, FL – Urgent, Inc.’s “This Woman’s Work Event” kicked off Women’s History Month on March 3, 2017 at the Historic Ward Rooming House in Overtown. From photography to spoken word Bronze Bra Honorees were showered with positive affirmations from talented teens from Overtown, Little Haiti and Liberty City. The Children’s Trust and neighborhood partner Black Archives History & Research Foundation of South Florida, Inc. sponsored this event. The Woman’s Work Event is a collaborative project between URGENT, Inc.’s Rites of Passage Youth Media Project and FACE (Film, Arts, Coding & Entrepreneurship) teen programs. “This Woman’s Work began as an assignment I gave to our FACE interns. Several years ago, I asked our students to interview and shoot a portrait of the woman that made an impact on their life. And then one day in a staff meeting, I shared the assignment and it became this event, and a chance to honor women who impact Urgent, Inc. and the community,” reflects FACE program coordinator, Terrance Cribbs-Lorrant. This year, students inter-viewed and photographed Board Chair of The Black Archives and granddaughter of Overtown’s earliest pioneer, Patricia Braynon; Miami Times Editor Carolyn Guniss; and Miami Edison Sr. High School Principal Trynegwa Diggs, creating the feature art exhibit of the day entitled “Art In Words.” Youth docents ushered in guests and gave personal tours of the exhibit. The audience loved it. Immediately following was a lovely rendition of the song “Believe” performed by Sister Izegbe Muhammad. Urgent, Inc.’s Vice President, Saliha Nelson, was inspired to recite a passage by Zora Neale Hurston. Rites of Passage interns Angene Bien-Aime and Eveul “Evo” Exil wowed audiences with spoken word performances followed by an original song written and arranged by three more talented teens thanks to a new partnership with Path to Hip Hop. “Next time make sure you place me first on the agenda. I can’t follow this talent,” were the sentiments shared from both Suited for Success Executive Director Sonia Jacobson who recited a personal piece and Miami Dade College Carrie P. Meeks Center Executive Director H. Leigh Toney who recited a poem by Nikki Giovanni. To close out the event, the “Bronze Bra” Awards, one of Urgent, Inc.’s highest honors, were presented to celebrate women and organizations that serve to uplift and support (like a great bra!) the community. Recipients of the “Bronze Bra” Award were Eileen Coogan, President/CEO of Allegany Franciscan Ministries; Dr. Marie Guerda Nicolas, Professor at the University of Miami; Andrea Fleming, Urgent, Inc. Parent; Magalie Gabriel, Urgent, Inc. Alumni, Miami-Dade County Youth Commissioner Shaunteria Guerrier, Miami Edison Sr. High School Principal Trynegwa Diggs as well as organizations Dade County Bar Association Horizon Committee and the Circle of Brotherhood. “Daily, we aspire to innovate and grow opportunities for our youth develop their skills, assets and talents so they are inspired to transform their community. But, we do not do it alone. Our success depends on the support of community partners and those as passionate as we are. This is one of the many ways we like to say thank to our partners in service,” says Saliha Nelson, Urgent, Inc.’s Vice President and Executive Director. For more details, contact Stephanie van Vark, at stephanie@stephaniecreates.com.